A strange mix of an online and offline. Your enjoyment of PDFescape will depend largely on whether you mind being tethered to your web browser to edit PDFs. There are various options available with PDFescape, and it can be confusing to start with. There's a desktop version that offers one free and two paid-for modes, and an online version that's free but limited. Still with us? 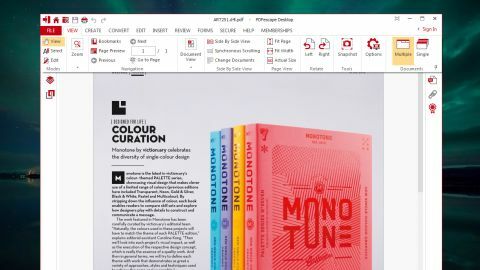 The free online version covers reading, editing, creation, form filling and annotation, but there's a limit on the size of PDFs that you can work with – 10MB or 100 pages. The free online editor is also unable to edit text in existing PDF files. PDFescape Desktop is the offline version of the tool, and this is available in Free, Premium and Ultimate editions. While the free version of the program is certainly useful, the two more powerful editions available are obviously more useful. Both of these are available on a subscription basis, which will come as a disappointment to anyone who prefers to buy their software outright. Existing PDFs can be converted into a variety of file types, and it's also possible to create PDF from existing files – although this is something that is very easily achieved with a wide range of other programs these days. While it's fair to say that there's nothing particularly wrong with PDFescape, it's just nothing very special either. PDFescape offers two completely different experiences. The desktop version of the software can be used to view and concert files for free, and create and edit PDFs if you're a paid-up user. The interface is very much inspired by Microsoft Office, and this brings a clarity that allows for instant usability. For anyone looking to create and edit PDFs for free, there's the option of doing so online. This is a handy option, but it does mean you have to be connected to the internet, and you'll find you're working with a rather basic interface.